Umbria’s shadowy landscape was making itself clear to me, the more I read about the region, and tasted, the more secure I was becoming in recognizing native varietals like Grechetto, Procanico, Sagrantino, and Verdello that make up wines unique to a key region in central Italy. Yet, I still hadn’t tasted a Sagrantino—the price point was too steep for casual consumption and almost all the Italian tastings I have attended focused on Super Tuscan or Piemontese wines (Barolo, Barbaresco, Barbera, etc.) because they capture a larger share of the market. My Umbrian curiosity would culminate in a menu built around a wine I had only read about, staging a late night dinner to highlight the prized red wine from Umbria. 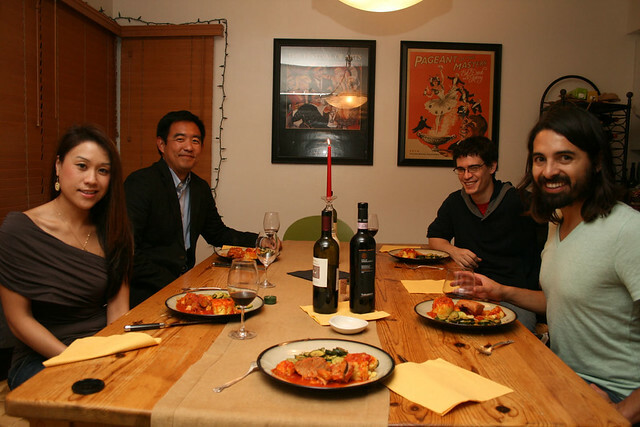 I had a few people over for a dinner that would feature the recipes of Latium (Lazio)—the home of the Latins. The region of Lazio shares some overlap with Umbria, at Orvieto, and I felt that would be the perfect segue into Lazio’s red wines. The region is southwest of Umbria and is better known for white wine production that blends Malvasia and Trebbiano. The recipes that were partnering with our wines were simple and savory; pork loin and polenta with marinated zucchini. 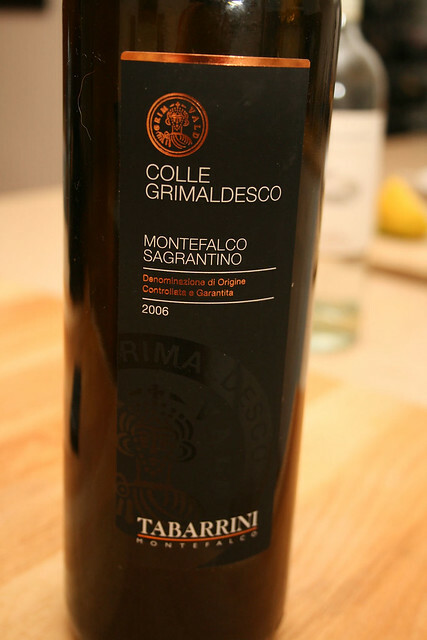 I had a couple bottles ready for the dinner: 2006 Tabarrini Colle Grimaldesco Montefalco Sagrantino and a 2005 Castel de Paolis Campo Vecchio Rosso from Lazio. A manageable crowd arrived late for a European dinner (later than 8:00! ), beginning the prep work around 8:45 pm. We worked almost immediately, cleaning, chopping and of course drinking as we prepared the dishes. I had a bottle of 2009 Lang & Reed Cabernet Franc to get us ready for the dinner. At that time, I also uncorked the other bottles to allow for some breathing and to check for corked wines. 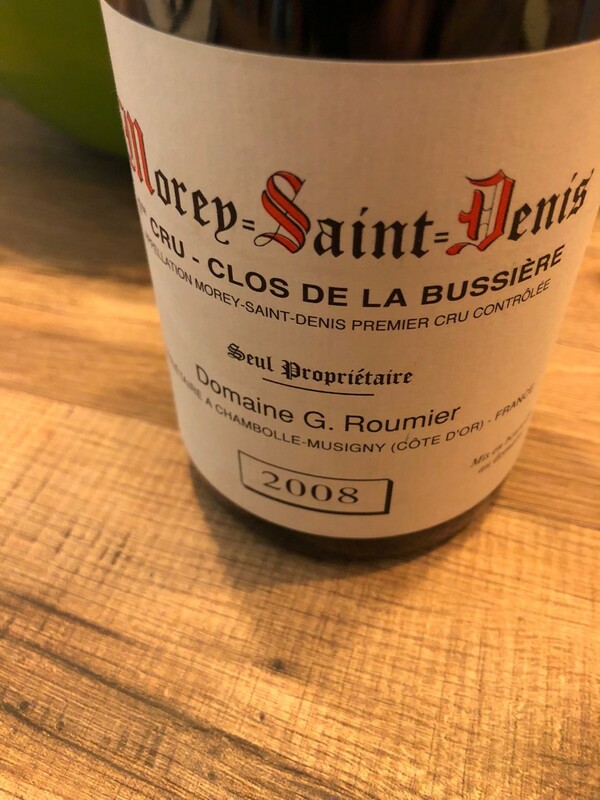 The domestic Cab Franc was ripe, trading that Chinon greenness of ferns and bell pepper for a bucket of new world fruit. It was delicious and worked well with the soft cheese I had put out on the table. The pork loin and polenta required participation from all of us, as well as the bulk of the ingredients. We opened a bottle of Orvieto for the sauce that would tie together lardo, vegetables and herbs. In various stages we layered flavors, adding more to the base (tomatoes and chicken stock) while the pork loin stewed. 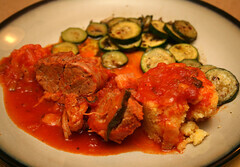 The polenta and zucchini took much less time, and about 10:40 pm we had the meal plated. We started with the Castel de Paolis, which opened up nicely. 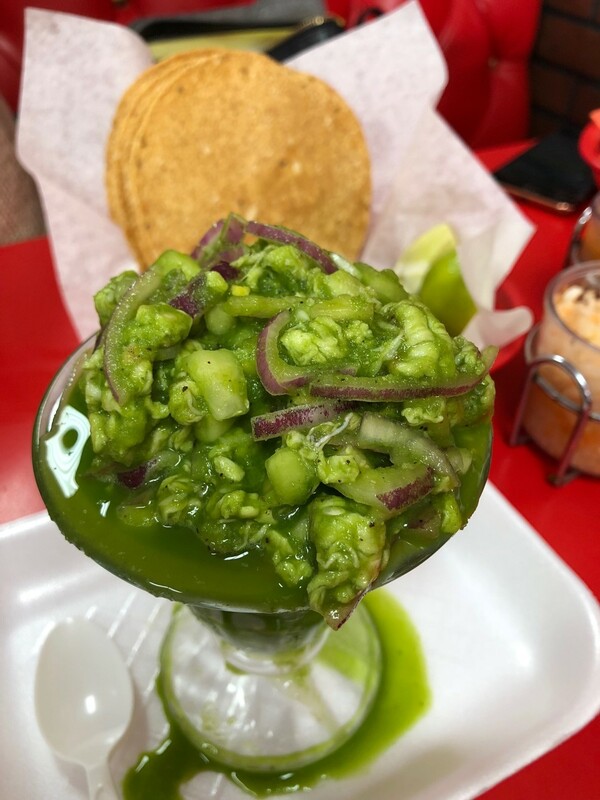 The red had dusty fruits with savory characteristics that were enhanced by the foods. The acidity also helped balance the tomatoes in the sauce. We switched over to the Sagrantino Montefalco halfway through the meal. The moment I had been waiting for had finally arrived and it was time to see if the wine could survive my high expectations. The Sagrantino was deeply garnet in my stemware, equipped with a moderately powerful nose of darker fruits, licorice, meat and herbs. It was complex and earthy; we could extract a passel of nuance from the nose. On the palate it had high tannins that a lot of people at the table were not fond of until they took a bite. It was also balanced by great acidity (medium plus) that helped it align with dinner. I was most surprised by the alcohol content (15% abv) that did not register while I drank it. Our plates were cleaned and glasses emptied. The dinner was a success, everyone raved about the polenta and pork loin and how the foods were in harmony with the Central Italian wines. The Sagrantino might not have been at its ideal point of maturity (though I didn’t have a reference point before I read about my producer), but the flavors were complex and lasting. I felt pretty good about my introduction to Sagrantino and better yet, about sharing the positive experience with friends. In southern Europe they eat late so food on the plate at 1040 pm is not considered late there. In northern Europe on the other hand dinner is normally served between 5-7 pm. After 7 pm is considered late. But there you are lucky if you will get anything else than lutfisk. What would you pour with the lutefisk? You can probably go three ways. One is to complement the fishy flavors like a pilsner (Lagunitas Check, Victory Prima Pils) or a German Hefe Weissen Bier (Sierra Nevada Keller Wies, Erdinger Wies). Another way is to find something that will hide the pretty nasty flavors (I think it’s nasty) if the dish with Oscar Blues Tin Fiddey or Cantilon Gueuze. The third way is to go traditional. The vikings probably had mead or braggot with their lutefisk. I’m not sure wine will work. Lutefisk is often served with a heavy mustard sauce so a wine that goes with mustard sauce might work. I suggest skipping the lutefisk all together. What a perfect way to enjoy the Lang & Reed Cabernet Franc, thank you for selecting it as your warm up to a fablulous meal! we are honored to be the lead off hitter! Your wine was excellent. It was balanced and one of the better examples of domestic Cabernet Franc that I have tasted. Thanks for reading. Delicious dinner and great wines. Looking forward the the next one.